Ok - before starting this project, I did a lot of research on ABS/Urethane fairing repair - youtube, about 6 motorcycle forums, read some bodywork books, and asked my local auto body supply house guys what they recommended. What I found is that there's no universal method/product for trying to repair fairings, that diff manufacturer's fairings are constructed differently, and that what some people call "done" is what I still call half-finished. To that point - I wasn't ready to trash the OEM fairings on my F2 before giving it a go on my own. Prev. owner laid the bike down - relatively low speed from what I can tell. some other previous owner had painted the bike up as a Smokin Joe replica, and the paintwork was very well done. (possibly before the F3 SJR was even released - who knows) I'm a fan of that paintscheme, so I'm going to try and save it. 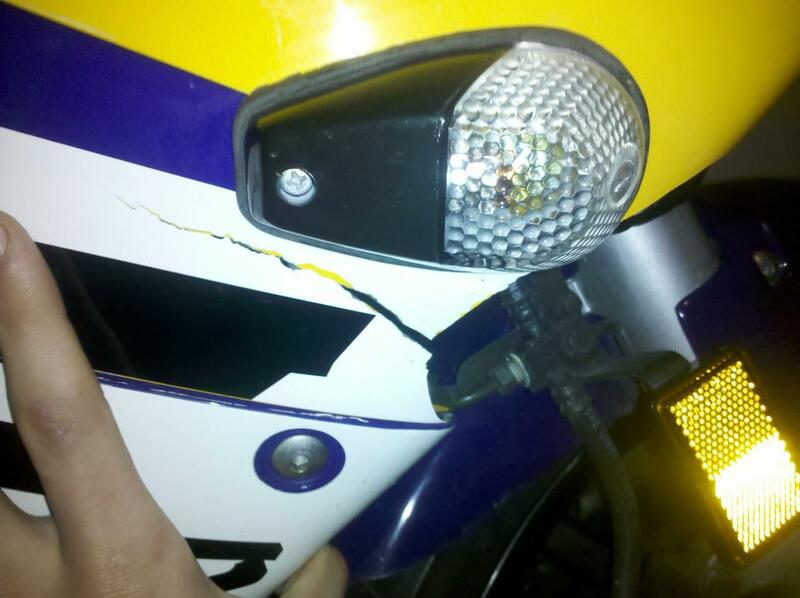 Well - the OEM fairings have a little flex to them - which is a bonus, I suppose, since they didn't completely shatter. The right side lower was ground all the way through to the case where the pulse generator cover is, and some scrapes/scratching here and there. The access cover took a lot of it, and I'm still working on it to try and get it saved as well. The upper fairing was cracked in several places, and missing 2 large chunks. You start out this process by trimming away the edges of the ground-down parts til you have almost full-thickness edges - I used a dremel tool for this. Also find all of the cracks, and drill a hole at the ends to keep the cracks from running. Use the dremel again and cut a groove along all of the running cracks to give some more raw surface area for the plastic-repair material to bond to. Now that you have your grooves cut, and all the plastic jigsawed back in line, you have to come up with something to fill the gaps and holes - Bondo is NOT what you want for this. I used a product a local body shop supply company recommended called Evercoat Maxim 813 adhesive. This is the stuff body shops use to bond new outer door skins and bed sides onto cars/trucks instead of spot welding these days - so it's pretty dang strong. It bonds with the ABS somehow. It also sets up in about 15 minutes, is roughly sandable in an hour or so, and fully cured in around 8 hours. It has a slight amount of flex when cured, so it seems to be pretty well suited for our semi-rigid fairings. It also is a 2part epoxy - but both parts are contained in the 1 tube, and it loads up in a standard caulk gun - super easy to use & mix. It did cost about $35 for the tube - but I didn't use much of it in all my repair. Next you need to give that stuff something to adhere to in the sections where material is missing. I used screen door mesh - local hardware store had a box of screen door repair panels that were roughly 4" square and were perfect for this. The mesh is metal, so it is flexible, and will hold a basic contour. I used packing tape to tape the mesh in from the back side of the panels. I mixed the epoxy in workable batches and laid it into each panel, until I had enough of it built up to be thicker than the surrounding bodywork. I've found over the years, epoxies adhere well to whatever you stick them to - but they don't always like being adhered to themselves sometime if you have to reapply - so build it up, sand it down. You can see where the epoxy seeped through the mesh and cured into it - this will strengthen the repair a lot. After everything sets up - you can start rough sanding - I used a DA sander on my compressor on the lower. That wasn't an option on the upper. I used a sanding drum on my dremel to get down close to a flush surface, and then finished by hand. Once you have the panels flush sanded, time for some good ole body filler to fill in any dips or pinholes. Yes - NOW you can use Bondo. Contrary to the mini-trucking crowd's beliefs, body filler is for minor surface smoothing - not molding new body panels out of. Again - with body filler, build it up, and sand it down. Rough it up w/80 grit before you apply. Sand it back down after the filler cures w/ progressively finer and finer grit sand paper until you're in the 400 grit range. This is what mine looked like after the 220 grit stage. After a bit more 600-grit final sanding, and you've done 98% of the prep work a paint shop would need to get your panels ready for spraying. Hopefully you just saved a good bit of cost if you're paying someone to do the paintwork. From here I dunno if I'm going to let someone try and do a paint match, or attempt it myself, but I knew I was ready to start priming - I used a combination of good quality aerosol can high-build primer to fill in surface scratches and a few coats of sandable primer, finally finishing with a coat of sealing primer for the time being. Looks pretty good. Wonder how long it will last under the stress of being ridden? Ok there are some pics. As you can see there is also a less than palm size chunk of fairing completely gone. Using the wire mesh do you think the evercoat stuff would be okay with the free edge? That's going to be my trouble area. Is the material strong enough to leave the mesh a bit short of the edge? For the crack would you drill the hole and shave off a little bit on each side along the crack and then use the fill or do you think you can just put fill behind it? im thinking as far as making it look flush from the outside you would have to, but it would be nice not to have mismatching paint. Idk, if you could give me a quick thought it would be appreciated as i would like to get on it before it spreads anymore. Also, if you were to do it a second time, would you use the same size mesh (maybe larger/smaller gauge, smaller/bigger holes) or double layer it perhaps? And does it say anything on the bottle that the stuff doesnt stick to, as i might be a good idea to fabricate something to keep the line from the ight fairing to the upper. If anyone else sees this feel fee to chip in your two cents....Thanks!! I did exactly what you're planning: I formed the wire mesh to follow the contour, and I used masking tape to build a "dam" around the area that I was going to be laying the epoxy into. I also turned up a lip on the mesh so that I would have a little more reinforcement along the edge. I can take a pic of the finished product this evening. I just finished wetsanding basecoat last night and the fairing is ready for clear now. For the crack - I can't tell there if it is stressed pulling it apart, or if there is just that much space between edges. I'd def back something that wide to give the epoxy something to grab. I wouldn't change the mesh size, it is there for form and the epoxy needs to seep into it some. It isn't hugely structural, but does help. I don't think the evercoat lists anything it doesn't stick to, but my experience is that epoxy can be laid up against a lip or "dam" made with masking tape/blue tape, and you can typically remove the tape once the epoxy sets. In the meantime I did new chain and sprockets,and I'm rebuilding a set of 94 forks with racetech springs to replace the stock 92 models. Last edited by adrenalnjunky; 10-13-2010 at 02:06 PM. Thats really cool... Fairings are so freakishly expensive. Thanks, ill use the tape for a dam as you suggested. hopefully i can get a good clean look out of this. My problem is at that point there is three different colors with straight. i sonHell at least it will stop the crack from spreading :/ Ill post better before and after pics with a real camera when i start the project, most likely next week sometime. how much they charge you for a rattle can of matched paint? I have touch up paint that i was going to brush on, but spray would look better. Again, thanks for the thread/input, you are a life saver! About $22 for a spray can of color matched. they also can make a bottle of touchup for color matching too. If you were to use the touchup paint, wetsand the current with about 600 grit to rough it up in the affected areas, apply your touchup, then wetsand the touchup paint with 1500/2000 gritti it is as smooth as you like. You may have to reapply the touchup a couple of times to get it built up thick enough. Once wetsanded, you can try reclearing the affected area to bring the gloss back, or wetsand the whole piece and clear the whole thing back out - wetsand then polish up with a fine cut compound.